Santorini (or Thira) is located at the southernmost point of the Cyclades and is essentially a complex of islands consisting of the islands of Thira, Thirassia (or Thirassia), Asprenissi, Palea and Nea Kameni. The complex of Santorini's islands, with Milos, Methana and Nisyros is actually an active volcano and probably the only volcano in the world whose crater is under the surface of the sea. 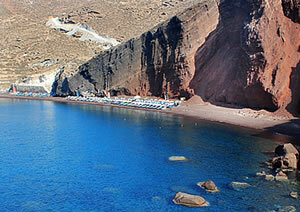 This island complex was created precisely because of this active volcanic activity. Twelve massive explosions, one every 20,000 years, had created a caldera that has broken down most of the volcano, but insists that it be built again and again. 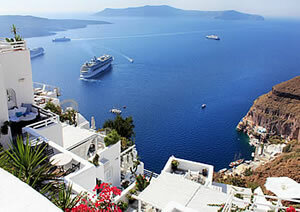 Santorini is known as the most romantic destination in Greece. It is nnot usual to see white houses, built on the edge of the cliff, with picturesque hamlets, cobbled streets and impressive churches ... Loved couples visit every year the volcanic island seeking to enjoy embraced in a balcony of Caldera the famous sunset of Santorini. Santorini island is also worlwide known as a destination that couples chooses to carry out their wedding ceremony or honeymoon. 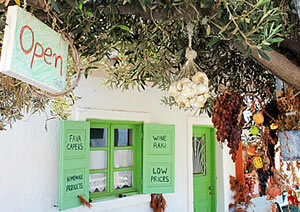 Santorini is also famous for its unique, local products. White eggplant, tomatoes, fava, capers and green cheese, all delicious ingredients of unique local dishes that will be appreciated by lovers of good food. The island is also considered one of the country's most organized wine tourism destinations. The volcanic soil of the island is ideal for the vinification of wines, with identity and heady aroma. Try the most basic varieties, such as Asyrtiko, Athiri, Adiani, Mantilaria and Mavrotragano, in one of the countless wineries of the island, as many of them appear to be museums or in one of the restaurants of the island, under the light of candles. It is also worth mentioning the wonderful beaches of the island, which could only be in harmony with its special volcanic character. Dive into the sea, visit beaches with black, red and white sand or colorful pebbles, sculptured by the salt and wind rocks. A unique scenery that you will not find anywhere else in Greece. This extraordinary atmosphere, where the blue of the Aegean blends with the reddish rocks and the white of the houses, will enchant you, making you look forward to returning to your own "lost Atlantis"! Let the energy flowing out of the volcanic landscape penetrate you and discover a magic place that you will never forget.